Bosley Professional Strength Regular Strength for Women Hair Regrowth Treatment (Minoxidil Tropical Solution 2%) is for women who have a general thinning of hair on the top of the scalp. Bosley Professional Strength Regular Strength for Women Hair Regrowth Treatment Minoxidil Tropical Solution 2% has been shown to regrow hair in women. Two 60ML (2FL OZ) bottles of Bosley Professional Strength Regular Strength for Women Hair Regrowth Treatment (Two Months Supply). The package one child-resistant dropper application. The package also contains an educational leaflet. Bosley Professional Strength Regular Strength for Women Hair Regrowth Treatment (Minoxidil Tropical Solution 2%) is for women who have a general thinning of hair on the top of the scalp. 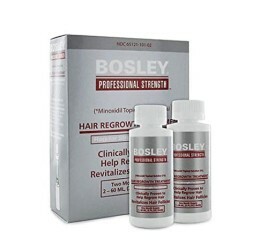 Bosley Professional Strength Regular Strength for Women Hair Regrowth Treatment Minoxidil Tropical Solution 2% has been shown to regrow hair in women. Apply one ML with dropper 2 times a day directly onto the scalp in the hair loss area. Using more often will not improve results. Continue use is necessary to increase and keep your hair regrowth or hair loss will begin again.